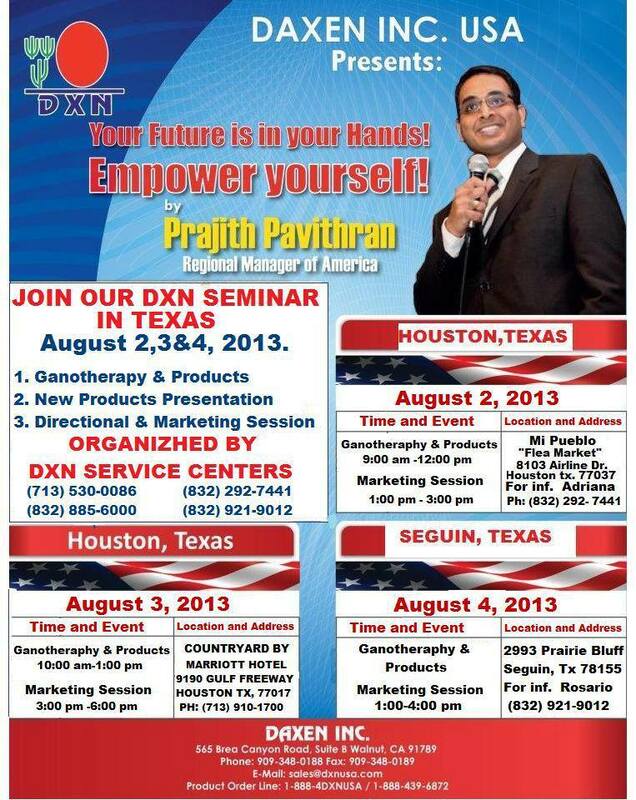 Welcome to a DXN Seminar in Texas by Prajith Pavithran the regional DXN Manager of America! ” What I am most proud of is that DXN has continuously conquered challenges. In the past, the present, and most definitely in the future when they come. DXN has stood triumphantly against the many tests of hardships. Through these years, DXN was able to establish its reputation as a true world-class corporate entity. Surely the path towards a successful venture is never easy but we have dealt with challenges considering it as an opportunity to grow and excel in DXN. I can assure you that if struggles present themselves, DXN’s exciting opportunities will take hold. Just be ready for success! If you want to reach health, wealth and happiness! Join our DXN Seminar in Texas: 2,3 & 4, August, 2013. ! You could learn how to be successful person in DXN and how can you enjoy physical and mental health and success with DXN! You could meet with already successful people in DXN! You could learn about ganotherapy and his benefits! You are honorable invited! Free entries and everybody welcome – members and non-members too! Be the part of this success! Join DXN now! Hello, I need to know if you have someone in Tyler, Texas that knows about your company, please let me know to get in contact with that person.